Sport England describes rock climbing as one of the greatest challenges of human strength, skill and endurance and one of the most rewarding sporting activities. Rock climbing has many benifits, to mention a few it develops muscle tone, improves flexibility, improves coordination and enhances focus. Our Mobile Rocking Climbing Tower enables us to bring rock climbing activities to a location of your choice so delegates can experience this fantastic sport. The activities we provide are extremely diverse and can be adapted to suit your event. 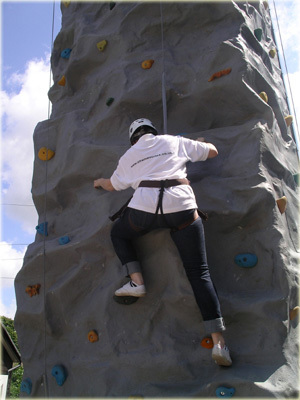 Our Climbing Wall and other activities can be used for a variety of events from Team building Days, Corporate Fun Days to Product Promotion and Product Launches. 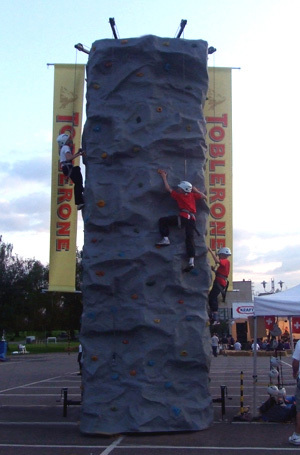 Our Rock Climbing Walls really create excitement at an event. Maybe you are looking for something different to add to a Team Building Day, or something to add the wow factor at your product launch? Our activities really can be used for almost anything. We have designed all our activities with you and your requirements in mind. All of our activities are equiped to offer you the opportunity to place your own branding onto the activity. There are a number of reasons why brandable activities may be important at your event. If you would like further information about our branding opportunities please contact us to discuss your requirements. When we attend an event, a First Aid Trained operator always attends and operators have valid Enhanced CRB Disclosures. We are also covered by our own Public Liability Insurance allowing us to bring the extreme sport of rock climbing to a venue of your choice. Fundraising ideas – charity rock climbing events.